New Xulon Book Delves into the Baptism of Fire: Why is it Needed? ...I believe this is a cornerstone work in giving a full explanation of the things that people are sincerely seeking today. 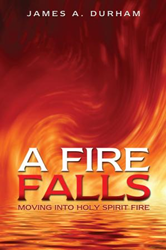 James A. Durham’s new book, A Fire Falls: Moving Into Holy Spirit Fire, ($16.99, paperback, 9781498437066; $8.99, e-book, 9781498437073) inspires people to intercede for the body of Christ to seek and receive the holy fire of the Lord in this season. The author firmly states that in order to prepare for the great harvest of souls, people need to understand that this is the time to be baptized with the Holy Spirit and the fire of God. The book delivers much needed clarity concerning the baptism of the Holy Spirit, which can often be misunderstood. The author makes known the urgency of such a baptism, especially for today. James A. Durham has been a pastor for over forty-eight years, and has studied and taught about Holy Spirit fire for many of those years. James is a graduate of Oklahoma State University with a Bachelor’s degree in psychology. He went on to pursue a Master of Theology from Perkins School of Theology, Southern Methodist University located in Dallas, TX. Additionally, the author has taught conferences on this material across the United States and around the world. Xulon Press, a division of Salem Media Group, is the world’s largest Christian self-publisher, with more than 12,000 titles published to date. Retailers may order A Fire Falls: Moving Into Holy Spirit Fire through Ingram Book Company and/or Spring Arbor Book Distributors. The book is available online through xulonpress.com/bookstore, amazon.com, and barnesandnoble.com.